Her new album is entitled Honeymoon, but for Lana Del Rey such romantic sojourns are bleak in the way of classic film noir. In her highly anticipated fourth album released on Friday, Del Rey returns to the sombre, cinematic sound that has made her among the most unique and complicated recent pop sensations. At age 30, the artist born as Elizabeth Woolridge Grant combines the glamour of a black-and-white-era movie star with the sexiness of a top model, yet with a constantly perceptible vulnerability. Her lyrical voice and troubled persona evoke the ghosts of singing greats such as Nina Simone and Billie Holiday, whom she both references on the new album including with a cover of Don’t Let Me Be Misunderstood, which was popularised by Simone. The album is haunted by allusions to past violence at the hands of men, a frequent theme for Del Rey that has contributed to her image as an antifeminist. “We both know the history of violence that surrounds you/But I’m not scared; there’s nothing to lose now that I’ve found you,” she sings on the title track, which is driven by the dark strings of a tragic film. “Ever since my baby went away/It’s been the blackest day/All I hear is Billie Holiday / It’s all that I play,” she sings. Del Rey offers a window into her worldview through a spoken-word interlude. Halfway through the album, she recites the opening of T.S. Eliot’s Burnt Norton. The poem, which begins Eliot’s Four Quartets, meditates on the idea of fate, with an underlying suggestion that our present experiences are out of our control. “I mean, life is a honeymoon, you know? Life, love, paradise, freedom ... that’s forever. With someone, or just with yourself,” Del Rey, who has cut back on interviews after controversies, told actor James Franco for the V fashion magazine. The New York-born transplant to Los Angeles also said, in a possible reference to the song, that she did not fear being “misunderstood” when she performs in France or Italy. Del Rey emerged in 2011 on the New York scene and quickly became a sensation on the force of videos that showed a raw authenticity. Tens of millions have watched her videos for Blue Jeans, a song about still loving a delinquent who leaves her, and Video Games, in which she relishes the attention of a boyfriend who is focused on his console. 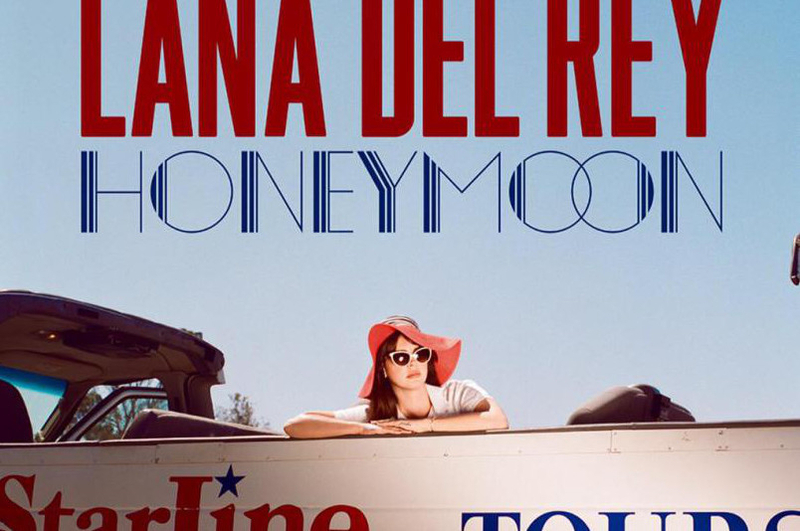 While the atmospherics of Honeymoon may be similar on the surface, the new album delves darker as Del Rey is no longer at peace. On High by the Beach, Del Rey sings of seeking to do nothing other than drugging herself on the sand as she calls it quits on a fraught relationship. High by the Beach brings in a heavy beat reminiscent of trap music, Del Rey’s latest subtle incorporation of other genres to her baroque pop. Her last album, Ultraviolence, brought in a blues-rock layer after she worked with Black Keys frontman Dan Auerbach. While the harder edges are gone, Del Rey brings in a flute on the dreamy Music to Watch Boys To, and on Salvatore, evokes Italy.